Velvety smooth, sweet and creamy-licious Filipino classic dessert LECHE FLAN or crème caramel. Easy, tried and tested recipe for any occasion. As I was writing this, snow was falling hard outside and though I like looking at the glistening snowflakes they made me think of the warm tropical climate of my archipelago. The shivers down my spine made me long for the sunny days in Manila. Since I needed to write a blog post about Leche Flan I thought I would tie it with some lovely photos of the Philippines. 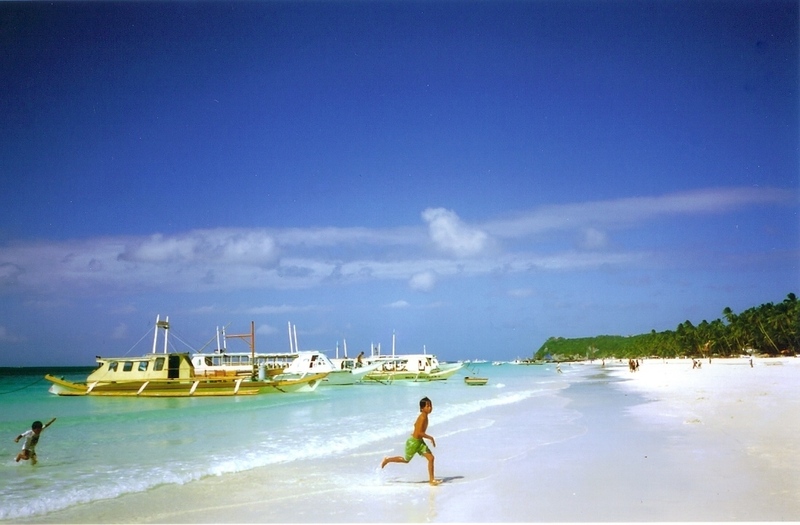 Of course, when I think “warm” the first thing that comes to mind is the white sandy beaches of Boracay. It’s not really warm there – more like “hot!” But the beach which has been named one of the world’s best a few times is the main attraction. White and fine as talcum powder, the sand makes walking on the beach not only ideal but truly romantic. Imagine the glorious sunsets and Boracay is well known for that too. 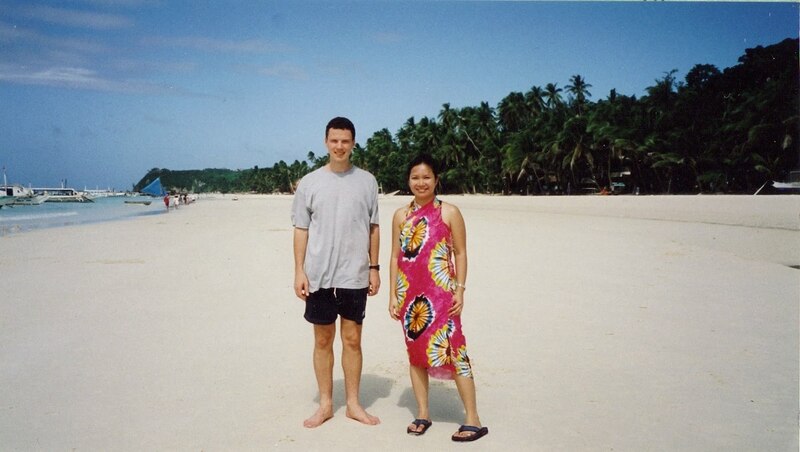 We love Boracay so much that we decided it would be our first stop on our honeymoon tour. 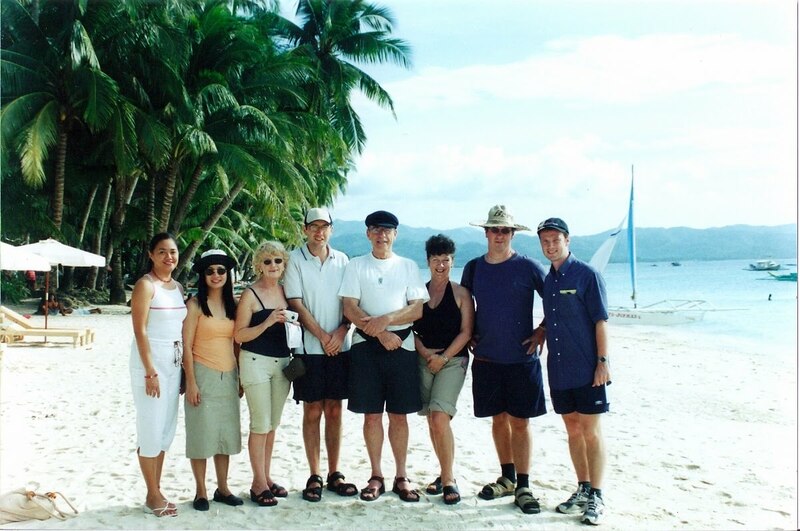 Rayner, Paul Priest, Margaret (Mark’s mom), Abby (me) and the manager of the resort where we stayed in Boracay. We thought that seeing as they had flown that far to attend our wedding, we should take them to Boracay as well! 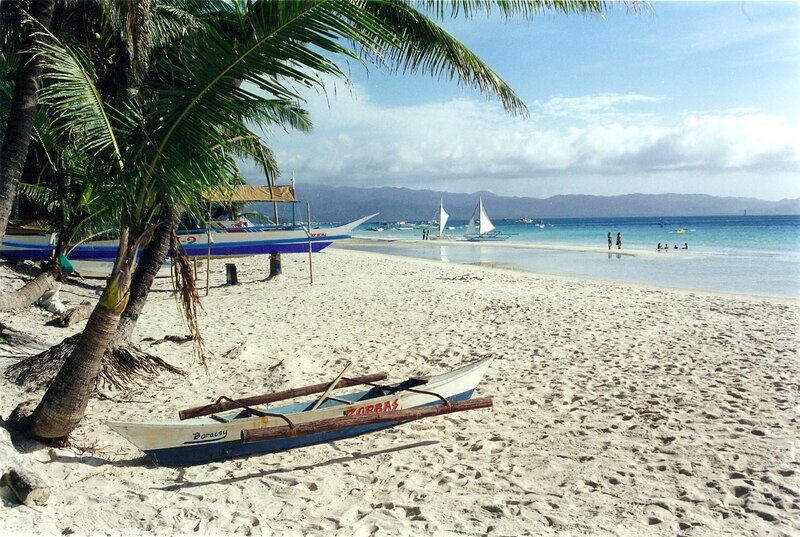 Another photo of Boracay taken by Mark. He is such a good photographer. He just knows how to capture the right angle and shot. The two photographs below were taken in Tagaytay where Mark and I got married. It’s about an hour drive outside of Manila and is a favorite place to visit during summer for its cooler climate. This is Taal Lake and Taal Volcano in the middle. With our first and secondary sponsors during our wedding in Tagaytay overlooking Taal Lake. What a happy day! Here are just some photos of the place where I spent my childhood. 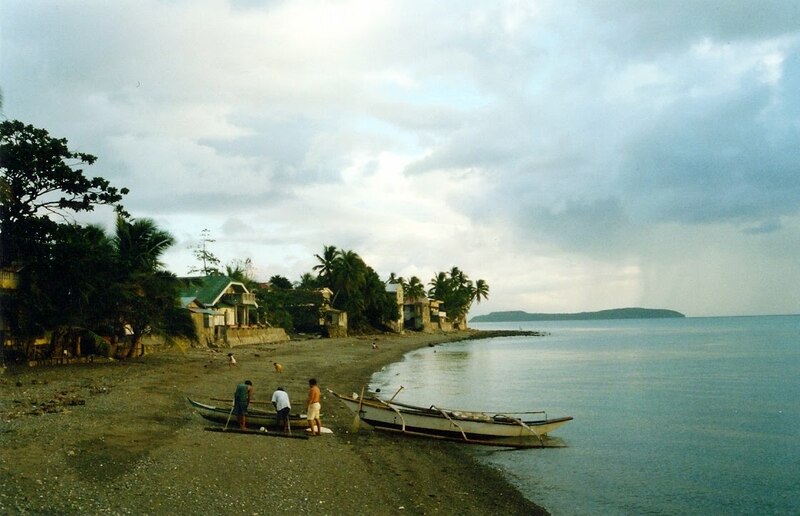 Our town is called Gasan and it is in the province of Marinduque, one of the 7,107 islands of the Philippines. twice. One time, a friend and I got caught out of our depth. I was able to swim myself but my friend was pulling me under. I really thought that I was going to drown. All I could do was pray – “O Lord, please save me”. Thankfully, my father arrived right on time and rescued us both. Amazing. It was in that same ocean where I almost drowned that I was baptized a few months later. The island you can see in the photograph above is Gaspar Island one of the three islands that belong to my town. Every summer we go to this island for swimming, snorkelling, barbecues and to have some fun! This is the sand bar that you land in as you approach Gaspar Island. The water is so clean and clear here as you can see. 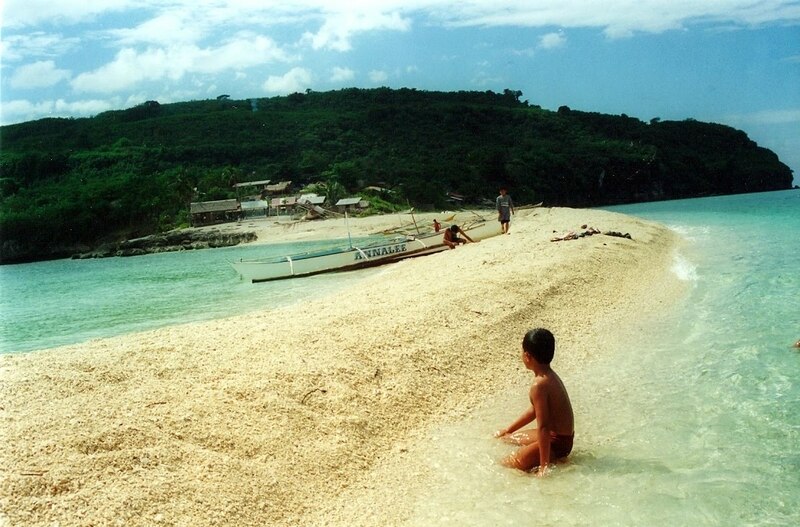 Our little island Marinduque is truly paradise in itself it will always be my home. Now about the recipe, Filipinos have a sweet tooth and we always love to eat, too! 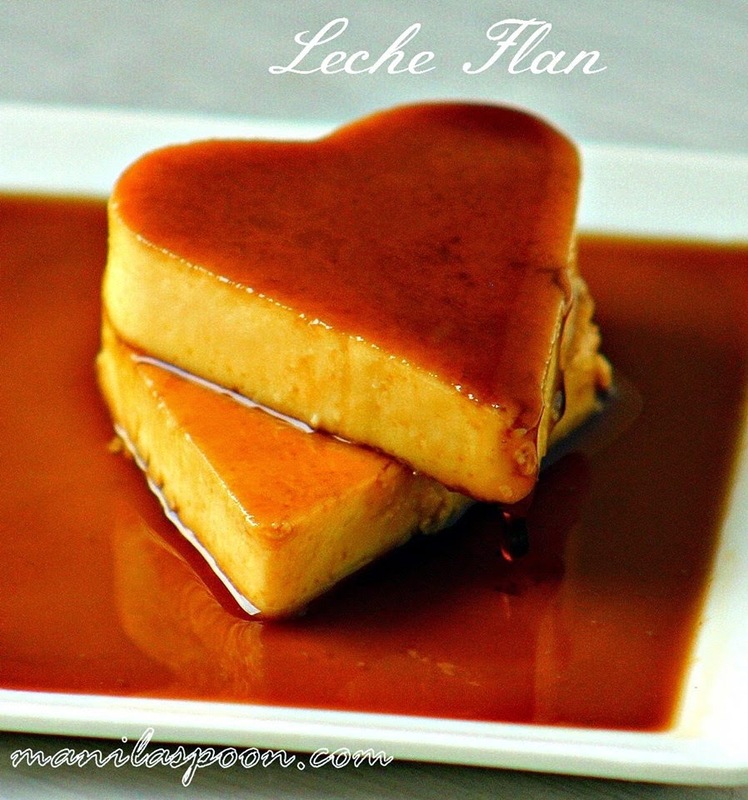 And one of our favorite desserts is Leche Flan (Creme Caramel) – a classic Filipino dessert. Traditionally, Leche Flan is steamed but here I am baking it instead so it’s much easier. Click on the above icon to print. Simply click on each image to remove the photos for easy printing. Don’t forget the llaneras or custard molds/ramekins. I use 2 llaneras (Pinoy oval-shaped tin molds) for this recipe. Have them at hand. To make the caramel, place the sugar and water in a shallow pan in medium heat. Stir the mixture and cook until the sugar melts and begins to boil. When it starts to really thicken, immediately pour the sugar on the tins/mold. Divide it evenly between the molds (if using more than 1). Spread it until it covers the bottom of the molds. The caramel should harden immediately. Set aside. Preheat the oven to 375 F/ 190 C.
Whisk together the egg yolks in a big bowl. Add the rest of the ingredients. Mix well. Pour the mixture in the prepared custard molds or ramekins. Place the molds in a baking dish big enough to hold all. Fill the pan with hot water (hot water from the tap is fine) up to half the height of the molds. Bake for about 30-35 mins. (Adjust the time depending on the size of molds being used). For my llaneras, 35 minutes is just right. The custard should have set nicely at this point. It will firm up more as you leave it overnight in the fridge. Cool completely on a rack and then refrigerate. Overnight refrigeration is recommended. To serve, run a thin knife around the mold and then invert onto a plate. Enjoy such creamy deliciousness! By the way, I used a heart cookie cutter to achieve the heart shape but you can of course use a heart-shaped mold if you have one. Thanks, Kat! Glad you like it. just when i think i've had enough dessert… looks like i'll need to make this! Beautiful photos! Especially of the beaches. And I love flan, that looks amazing. I saw this recipe the other day and fell in love with it. I used to eat flan while living close to the Mexican border. I love it. I appreciate your letting me use the recipe and photo for my Date Night/Valentines post. Thanks so much. I will let you know when the post goes live! This is a best blog I read. It is interesting. Especially the making of Leche Flan,this is one of my favorite dessert. Thank you for this one. Hello Haidie! Always happy to see a kababayan read our little blog. Glad you enjoyed the post. Visit us often! Thanks! Thanks, Bini! This is such a more-ish dessert! Hope you get the chance to try it. No, I don't think it makes a difference in taste. Perhaps in texture but I can hardly notice any either. The baked one is also creamy and smooth. Thanks for stopping by April. A big "Thank You". You have brought me such joy over the last month. Last night I made this flan. It was enjoyed by both. My best friend was from the Mindoro Island. Our dream was to take our children to visit. Cancer prevented this. Her boys, my kids, and I miss her cooking terribly. I have made several dishes you have posted. This one was a real treat for her young boys. I have shared these pictures with all of the kids. We still plan on making the trip in honor of Lucy. We are thrilled viewing your pics. Thank you for sharing so much of your life and culture. It truly is a blessing to all of us. Oh Keri, I am terribly sorry to hear this. Thank you so much for stopping by and sharing your very sweet thoughts. I appreciate it truly. Glad you find the website to be helpful. Would it be ok to replace the lemon zest with vanilla extract? You can try it, if you like it, Ruz. Thanks for stopping by. I add the lemon zest for some tang but am sure vanilla should be fine, too. I love the personal touches in this post- You guys remind me so much of my own family! Now this recipe- Delicious- Perfect for an after dinner treat! Thank you for the beautiful photos, and the recipe. 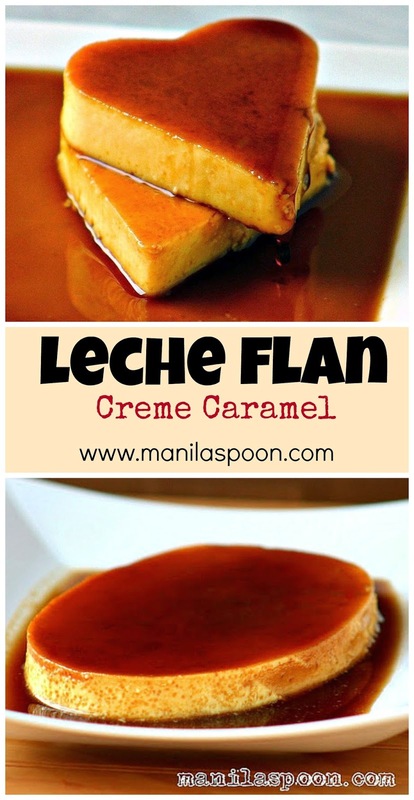 I have never made leche flan but now that you showed how to make it in the oven, I'm going to give it a try! One of my favorites that I've not had in years!